Whether you're building a new home or remodeling, natural stone offers you unparalleled beauty, functionality, uniqueness, and adds true value to your home. Granite and marble, two of the most popular stones among homeowners, are quarried in the form of huge blocks. These blocks are cut into slabs generally 3/4" or 1-1/4" thick and the faces are polished to the specified finish. The slabs are then carefully crated and shipped to fabricators worldwide who process them into the final product. A leading consumer magazine recently compared granite with quartz, ceramic tile, laminate, butcher block, and other manufactured surfaces. Granite received the highest overall performance rating as a kitchen countertop material. There are different grades of granite available in the market which also dictates the price and quality of each stone. A "C" grade is typically the lowest grade of granite because the surface polish is substandard and there is no resin coating. As a result, these granites will require more maintenance over their lifespan and the risk of staining is greater. When you get an "A" or "B" grade of granite, the surface polished is flawless and there will be a resin coating applied that will further protect the slab. Because of this, these slabs are more durable and require much less maintenance. At RevitaStone, to keep our superior reputation we only bring in "A" and "B" grade materials so our customers can rest assured they are getting a superior product. Granite’s durability and striking array of colors make it ideal for kitchen countertops and other heavily used surfaces, including table tops, vanities and floors. How to Choose the Right Stone for Your Home? Natural stones are available in a beautiful spectrum of colors and patterns with a pronounced natural character only nature could design. Unlike the repetitive sameness of materials produced by machine or assembly line, natural stone’s naturally varied appearance has wonderful character and creates a one-of-a-kind effect everywhere it is used. A flamed finish is a rough-textured surface used-frequently on granite floor tiles. The harder the stone, the more it resists abrasion. One measure of a natural stone’s strength is its Measurement of Hardness (MOH) rating, on which 1 is the softest and 10 is the hardest. On the MOH sale, most marbles rate “3” and quartz-based granites rate “7”. Using a softer stone simply requires the homeowner to use more gentle cleansers and more care to prevent scratching. Marble adds a sophisticated element to your home, and its wonderful appearance, superior engineering characteristics, and ease of maintenance make it a natural choice for floors, wall coverings, table tops, and bathroom walls, floors, vanity tops, tub decks, showers. Marble, however is much softer and more porous than a granite or quartz countertop and will require more maintenance and care to avoid staining and scratches. Granite has several advantages over other countertops. Because granite is so strong and durable, it will last for years with little effort on your part. 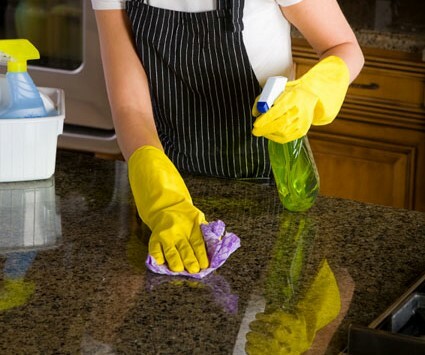 Cleaning granite is as simple as wiping it down with a soap and water mixture. Quality grade granite slabs are sealed and resin filled to prevent staining and this clear finish is what makes them so easy to clean. Once a year it is suggested for our customers to seal their granite countertops. Even if the grade of granite is superior, sealing provides peace of mind and is so simple and painless all you have to do is wipe on the sealer with a rag and within a minute wipe completely dry.